In 1919, at the age of thirty-one, Helen Clay Frick inherited $38 million, becoming the richest single woman in America. These riches, however, came at a price. Helen's tumultuous early life was shaped by her father's infamy as a union strikebreaker and the ensuing attempt on his life, her mother's debilitating depression, and the death of her older sister and newborn brother about a year apart. Despite these events, Helen built a luminous legacy through her lifelong commitment to social welfare, the environment, and a supreme devotion to the visual arts. Helen's philanthropy touched the lives of thousands. Her contributions included a vacation home for young female textile workers, two wildlife preserves, one a public wilderness park, a Victorian-era house museum, a pre-Civil War historic Mennonite village, a university fine arts department, two art history libraries, and the purchase of many significant works of art for her private collection, the Frick Collection in New York, the University of Pittsburgh teaching collection, and the Frick Art Museum. Through extensive period research and singular access to Frick family archives and Helen Clay Frick's personal writings, Martha Frick Symington Sanger fashions a multifaceted portrait of a complex, often misunderstood, yet indomitable humanitarian, philanthropist, and cultural force in twentieth-century America. Martha Frick Symington Sanger is the author of Henry Clay Frick: An Intimate Portrait (1998), which was cited in August 2007 in the Wall Street Journal by Carnegie Corporation president Vartan Gregorian as one of the “five best” books detailing the lives and contributions of great philanthropists in America’s gilded age. 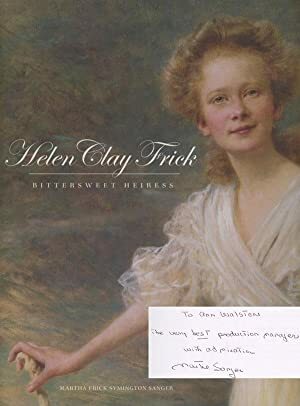 Her second book, The Henry Clay Frick Houses: Architecture-Interiors-Landscapes In the Golden Era (2001), captured in great detail the homes Frick built in Pittsburgh, New York, and Boston’s North Shore. In 1991, Ms. Sanger served as an advisor for the introductory video of the New York Frick Collection and exhibitions at Clayton (now a house museum at the Frick Art & Historical Center in Pittsburgh) and has also been instrumental in widening the use of the family papers and art history materials contained in the voluminous Frick archives. Ms. Sanger also was as a consultant for the 1995 two-hour PBS documentary on Andrew Carnegie, “Richest Man in the World,” produced by WGBH. Martha Frick Symington Sanger lives in Stevenson, Maryland. She is the great-granddaughter of Henry Clay Frick, and has three daughters and five grandchildren. Her Web site is www.frickhistory.com.